The historian Joseph J. Ellis describes the early days of the United States as “a decade-long shouting match” characterized by “shrill, accusatory rhetoric, flamboyant displays of ideological intransigence, intense personal rivalry, and hyperbolic claims of imminent catastrophe.” In more recent times, the Vietnam War and Watergate deeply divided the country, and the administrations of Presidents Bill Clinton and George W. Bush were marked by sharp partisan conflict. The latest manifestation of this polarization has been the presidential primary race, defined by the emergence of real-estate magnate and reality-TV star Donald J. Trump on the right, and Senator Bernie Sanders on the left. Both Trump and Sanders espouse positions that only recently would have been way out of the mainstream—such as deporting 11 million undocumented immigrants (Trump) and providing free public college tuition for all (Sanders). The strong, durable support both candidates receive illustrates how polarized US politics has become. Research I’ve conducted with Atif Mian of Princeton University and Francesco Trebbi of the University of British Columbia suggests a reason politics has come to this: an increase in polarization after banking and financial crises is common and predictable. Greece's debt crisis polarized Europeans, and the debtor-creditor relationship evolved into a political tug-of-war. In the US, decisions made during the 2007–10 financial crisis to rescue Wall Street fueled public anger that still resonates with voters of both parties. The aftermath of the crisis—which included erasure of trillions of dollars of housing wealth and continued income stagnation for the working and middle classes while the wealthy benefited from rising asset prices—has provided fertile ground for even more partisanship and polarization. This polarization, our evidence indicates, is a product of the banking crisis. We used the American National Election Study (ANES) Time Series Cumulative Data File to follow respondents’ self-reported liberal-conservative scores from 1948 to 2008, and then brought the file more up to date by adding data from the 2012 ANES Time Series Study, as well as data (from Poole and New York University’s Howard Rosenthal) that estimates legislators’ positions on the basis of their roll-call voting records. Combined with a comprehensive data set (covering 1800 to 2008) on global financial crises assembled by Carmen Reinhart and Kenneth S. Rogoff of Harvard University, these findings led us to some general conclusions about the impact of financial crises on political polarization. Polarization in Congress has increased steadily over the past four decades, but our research suggests that it rose more sharply after banking crises and market crashes. And this pattern extends beyond the US: after financial crises, polarization among voters was common across all 70 countries sampled in the Reinhart-Rogoff data set. We also took data from about 250,000 individual interviews from 60 countries, in which respondents described their political ideologies, and we matched that with Reinhart and Rogoff’s pre- and postcrisis indicators to construct a picture of people’s ideological tendencies five years before and after financial crises. Our conclusion: financial crises tend to radicalize electorates. After a banking, currency, or debt crisis, our data indicate, the share of centrists or moderates in a country went down, while the share of left- or right-wing radicals went up in most cases. What does this do to political decision making? Not surprisingly, we find, after almost any financial crisis, ruling governments became substantially weaker, while opposition coalitions grew stronger. This increased overall political partisanship and fragmentation, often leading to gridlock and ineffectual policy making, just when bold moves and major financial reforms might have been particularly beneficial. It’s a catch-22 that could in turn lead to further disaffection and polarization among the electorate, prolonging the impact of a crisis. It takes a charismatic leader to break the stalemate, someone who can implement good policies and manage the polarization. President Franklin D. Roosevelt was one such leader. Using fireside chats and a lot of effort, he managed to form a coalition large enough to pass legislation that helped pull the US out of the Great Depression. Princeton’s Nolan McCarty, University of Georgia’s Poole, and NYU’s Rosenthal attribute the polarization after financial crises to increased income inequality, which leads to conflict between the haves and have-nots. That explanation has merit. My colleagues and I focused especially on the nature of the debtor-creditor relationship, which after a crisis can become a political tug-of-war. Every banking crisis is associated with excessive lending. In his masterpiece Manias, Panics, and Crashes: A History of Financial Crises, the great economic historian Charles P. Kindleberger finds that “asset price bubbles depend on the growth of credit.” As the bubble develops, borrowers who are less and less creditworthy take on more and more debt. To simplify greatly, this is what happened in the US housing bubble of the 2000s. Between 2000 and 2007, US household debt doubled to $14 trillion, and the household debt-to-income ratio skyrocketed from 1.4 to 2.1, an increase matched only in the early years of the Great Depression. As Atif Mian and I documented in our 2014 book House of Debt, there was a big expansion in lending to marginal borrowers during this period. Astonishingly, mortgage-credit growth for home purchases and income growth became negatively correlated as the bubble developed, and many borrowers—even those in the middle class—used the rising value of their homes to extract equity and to finance consumption. Unfortunately, a financial system that thrives on massive use of debt by households concentrates risk squarely on debtors, who bear the brunt of any losses. So, when the housing bubble turned into a bust, the most-marginal homeowners took the biggest hit. In any debt contract, someone has to take the loss associated with a decline in the asset’s value. It becomes a zero-sum game between lender and borrower, and this time the political battle became especially heated because the losses were so big. The Great Recession wiped out 8 million jobs and some $2 trillion in income by 2012. House prices fell by $5.5 trillion, and more than 4 million homes faced foreclosure—about 5 percent of all mortgages in 2009. Marginal borrowers, who had little net worth beyond their home, were virtually wiped out. Consumption, which was overheated during the boom, collapsed. Yet when the housing bust turned into a financial crisis, policy makers’ first instinct was to save the lenders—i.e., the banks—out of fear of contagion. Thus were AIG, Fannie Mae, and Freddie Mac effectively taken over by the government under the aegis of the Troubled Asset Relief Program (TARP), passed and signed in 2008. Big mortgage lenders, including Wachovia, Washington Mutual, and Countrywide Financial, were bought by other large banks whose liquidity was essentially guaranteed by the US Treasury or the Federal Reserve. Even two big investment banks, Goldman Sachs and Morgan Stanley, were quickly converted into commercial banks so they could be “rescued” by the Treasury and the Fed. And so the Tea Party was born out of anger that debtors would get special breaks at a time when creditors already had gotten plenty. The Tea Party movement got even stronger during the battle over the Patient Protection and Affordable Care Act (better known as Obamacare) in 2009 and 2010, and its central issue became rapid expansion of government debt, but its initial impulse was to unite against any breaks for debtors in the wreckage of the financial crisis. The movement had a huge impact, engineering a big Republican takeover of the House of Representatives in 2010 and laying the groundwork for the epic battle over the debt limit in the summer of 2011 that took the country to the brink of default, cost the US its AAA rating from Standard and Poor’s, and led to massive mandatory spending cuts to domestic and military programs. Just weeks later, demonstrators occupied a park in lower Manhattan, protesting income inequality, foreclosures, Wall Street corruption, and the power of money in politics. With their soon-to-be-famous slogan “We are the 99 percent,” the Occupy Wall Street movement spread quickly across the country. Though the Occupy movement probably had less direct political impact than the Tea Party did, the two movements uncannily illustrate the debtor-creditor split after financial crises, with the Tea Party siding against debtors and the Occupy movement with them. In Europe, too, the political battle was joined along creditor-debtor lines. The increase in household debt from 2000 to 2007, and the subsequent decline in consumption after the recession began, was greater in Ireland, Denmark, Norway, the United Kingdom, Spain, and the Netherlands than in the US. The economic crisis quickly morphed into a sovereign-debt crisis as governments of the eurozone spent an estimated €500 billion, or 5 percent of GDP, by the end of 2013 to “rescue” the banks. Meanwhile, the recession decimated government tax revenues, throwing weaker economies deeper into debt. Governments of countries hit hardest by the recession got into deep trouble with nervous creditors who worried they would never be repaid. Greece’s debt problems were especially severe. Almost from the time it adopted the euro in 2001, its deficits exceeded the mandated target of 3 percent of GDP. Only after the financial crisis and Great Recession was the extent of its trouble revealed—total debt of €300 billion, the highest in its modern history, reaching 113 percent of GDP in 2009 as its budget deficit hit 12.7 percent of GDP. Bond yields soared as ratings agencies downgraded Greek debt to junk status. Thus began more than five years of intermittent crises in which Greece had to renegotiate its debt several times, threatening the very existence of the euro. Greece’s banks collapsed and unemployment soared to nearly 26 percent in 2015, unleashing a firestorm of political polarization both inside the country and across the eurozone. As a creditor nation, Germany (whose total exposure to a Greek default and exit from the euro could range from €61.5 billion to €84.5 billion, according to Der Spiegel) took the hardest line in debt negotiations, led by the strong-willed Chancellor Angela Merkel. Politicians in Germany directed their anger toward Greeks instead of toward the German banks that made poor lending decisions. In a YouGov poll taken in July 2015, more than 60 percent of Germans (and 74 percent of Finns) said Greece should be held to the original terms of its loans, with no more bailouts. 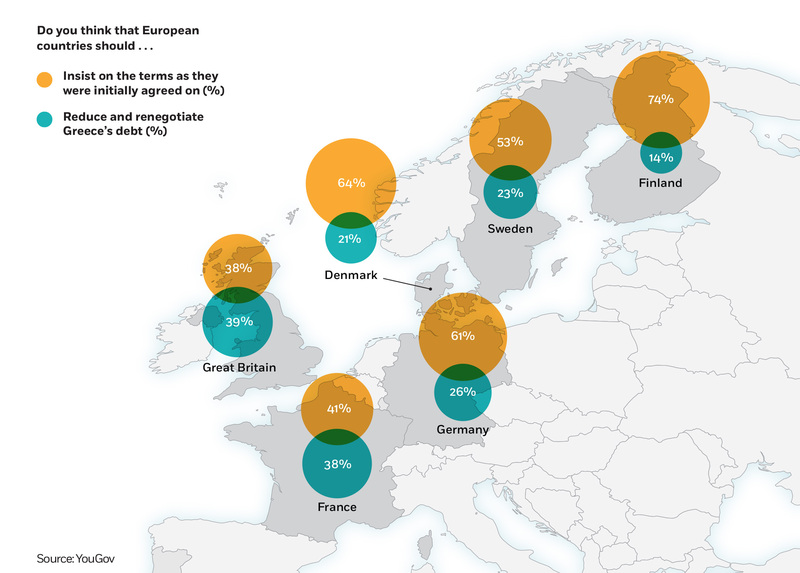 The less-exposed public in France and Britain were more sympathetic to Greece and more open to renegotiating the terms of the loans, according to YouGov. Greek voters, by contrast, took a classic debtors’ stance and in 2015 elected the left-wing Syriza party, whose leader, Alexis Tsipras, called for repudiating some of Greece’s debt, reversing mandated spending cuts, and even leaving the euro. As prime minister, Tsipras eventually capitulated and a deal was struck last July, but the political polarization has only deepened. The violently anti-immigrant, anti-EU, neo-Nazi Golden Dawn got 7 percent of the votes in last September’s general election, even though its leaders are facing criminal charges. That’s certainly true here in the US as well, where Trump’s presidential campaign in particular exploits an underlying angst that the government is representing well-organized special interests at the general public’s expense. Ironically, much of the support for the Sanders campaign also reflects the same angst. This, rather than the classic debtor-creditor conflict that emerged with the Tea Party and the Occupy movement, is behind much of their backing. But the candidacies thrive in a hyperpartisan political environment that is the financial crisis’s true legacy. Trump and Sanders may be the indirect by-products of that crisis, but they are nonetheless its legitimate heirs.